Many of us within HumanaNatura are strong advocates of permaculture and the placing of greater emphasis on ecological sustainability in our lives and global society. After all, in many areas of modern life – from the foods we eat to the cars we drive and the houses we live in – we have not achieved ecologically sustainable practices. Overall, our general mode of life today threatens the planet (and us) with long-term environmental degradation. Given this, the ideals and growing science of permaculture have great appeal. Unfortunately, not all practices that occur or are advocated in the name of permaculture today are true to its essential goal of environmental sustainability, which can be thought of alternatively as ensuring ecological health. At the same time, and as I will highlight, other permaculture practices that do foster ecological sustainability can be shown to be less than optimal from the standpoint of promoting human health. In fact, when we broadly survey current permaculture practices, we can see these two shortcomings quite frequently, at least in part reflecting permaculture’s early and still developing nature as a field of applied science. Importantly, however, these common permaculture shortfalls appear readily correctable – via new effort to achieve deeper understanding and improved application of the inter-related science that spans ecological and human health considerations. At the same time, these less than optimal “permaculture” practices are revealing. They circularly reflect and perpetuate ecological and human health misunderstanding in our time. They lead to misdirected efforts and resources. And they ultimately weaken or slow the essential modern advancement that is permaculture’s basic proposal of fully sustainable human living arrangements. For these reasons, I would like to take up and encourage new exploration of contemporary permaculture principles and practices from a natural health perspective, one that spans both ecological and human health research. In the discussion that follows, I will begin by first illustrating important ecological and human health gaps or misconceptions that are now fairly widespread in self-identified permaculture practices. But more importantly, I will then show how these gaps can be promptly closed through a more holistic and careful use of available human and ecological health science. This critical change can help aspiring and practicing permaculturalists achieve a larger and more accurate sense of our long-evolved human condition, as well as an improved understanding on how our environmental and species health needs can be concurrently and synergistically pursued. In this essential discussion for anyone interested in human and ecological health issues, I will sample modern eating practices, in and out of present-day self-described permaculture efforts, and explore their underlying relationship to modern food production methods. This approach will allow me to demonstrate how a re-naturalized, more optimal, and fully sustainable model for both modern human eating and modern food production can be achieved via a new and broader synthesis of contemporary health, ecological, and evolutionary science. Before continuing, however, let me underscore that this companion and complementary exploration of ecological and human health science has implications far beyond the topics of nutrition and food production. In principle, the approach can be applied productively to many other domains of modern life and endeavor – in essence, wherever human and ecological health goals may or must be pursued in tandem. As you may know or can learn about here, the modern permaculture movement has roots extending back at least to the 1920s, but achieved greatly increased attention with the groundswell of new ecological awareness that occurred in the 1970s. In both cases, the central idea of permaculture is that, unlike today and during pre-modern times, a permanent agriculture or ecologically sustainable human food production systems are possible, desirable, and even essential to the long-term survival of modern life. And though the term permaculture has been expanded to include the exploration of permanent culture or social sustainability more broadly, at its core and with good reason permaculture still remains principally focused on promoting sustainable food production, including stopping ecological and societal harm caused by industrial farming practices and methods. Early permaculture experiments, exploring and demonstrating the promise of sustainable food systems, quickly moved to a new model of agriculture that imitated self-perpetuating natural ecosystems, whether at a home or commercial level. Often called food foresting or forest gardening, this science-based and re-naturalized model of modern food production has proven remarkably successful in early applications and across a wide range of climates. It is now the subject of vast but still greatly under-appreciated improvement and scaling efforts around the world. The approach is even being used to reverse prior human-induced desertification and land degradation via traditional farming and economics. Thanks to these early successes, we now have good reason to believe that permaculture food production – as we will discuss, especially when used to support an optimized natural human diet of greens, fruits, and lean animal proteins – will represent a second Agricultural Revolution in the making, one that allows for intensive human food production and modern population levels, but without the ecological harm that has marked most earlier forms of human agriculture, social organization, and economics. Key permaculture food production practices developed to-date include: 1) the ecologically friendlier use of perennial instead of traditional annual food plants, 2) diverse and complementary plant foresting rather than mono-culture farming, 3) natural and symbiotic integration of livestock alongside food plants, 3) soil conservation via the avoidance of tilling and the active use of natural mulches and composts, 4) aggressive water retention and water recycling, and 5) the avoidance of external and non-renewable inputs of all kinds (including industrial fertilizers and pesticides). Today, agricultural scientists are slowly recognizing the revolutionary importance of these nature-aiding practices, and some have begun to analyze and consider ways to apply and improve upon these often quite successful permanent food production efforts. As this combined effort of practice and study proceeds, it appears likely that it will validate the viability and increase the practical efficiency of permaculture food production practices in the years ahead. At the same time, this combined effort also appears at risk of overlooking a critical dimension essential to the long-term effectiveness of human permaculture. As suggested in my introduction, this oversight involves human health considerations, especially ones that form a natural and necessary complement to permaculture’s ecological health goals. Importantly, the effects of this omission of human health considerations in permaculture’s early development are now readily apparent in the field. It can be seen whenever we find either permaculturalists or researchers operating with an inadequate or distorted conception of an optimal human diet and thus our needed food production system outputs. And it is equally apparent when either group operates with a weak, ambiguous, or presentistic sense of what adaptive human life entails more generally. For this reason, without a more expansive and ultimately more anthropomorphic approach to permaculture, we risk developing permanent agricultural systems that are viable for our planet but not optimal for ourselves – ones that promote greater ecological health and sustainability but not progressive human health and vitality. And while it is true that this less than ideal permaculture outcome might be a net benefit to us as a species, there is compelling evidence to suggest that healthier and more natural human living patterns may help to naturally aid permaculture. Indeed, it may be the case that truly sustainable human permaculture systems may be attainable only with more attentive and concurrent thinking about our optimal human living arrangements. As we will discuss next, consideration of human eating and its relationship to human food production methods offers a telling portrait of this natural relationship between human and ecological health factors. In our discussion, you will quickly see how more natural and optimal eating patterns can naturally advance and complement permaculture food systems, at once producing eating and food production patterns are both healthier for us and for our planet. Given this enormous potential – for human health considerations to both inform and complement permaculture’s crucial focus on ecologically sustainable food production and culture – I believe it is essential for health advocates and scientists, in and out of the HumanaNatura community, to now take up and actively shape our modern-day consideration of needed permaculture goals, practices, and research. Beginning next, I will equip you to do just this. If you were unfamiliar with permaculture, I hope my introduction has helped you to understand its core goals and emerging scope of new and ecologically healthy food production methods. While permaculture is straightforward in concept – human food production and culture that does not harm the planet – I should add that this simplicity can be deceptive and lead to superficiality and poorly considered practices. As I suggested when characterizing permaculture as a second Agricultural Revolution, permaculture is indeed a new and revolutionary outlook on society and our place in the environment. This new outlook recasts our past and modern agricultural processes, and the economic and social systems that rest on and in turn drive them, as inherently undesirable, harmful, and in need of sweeping and re-naturalizing change. The move from traditional to permaculture-oriented thinking, in and out of agriculture , has been likened to the switch from believing the world is flat to entertaining the idea that it might instead be round. Though permaculture is a plain and easily outlined change in outlook in one sense, it also involves a far-reaching upending of our most basic notions about the world and gradually leads to new conceptions of how and where we might live. To recap, when permaculturalists talk about permanent agriculture, they refer to farming, ranching, and food gardening practices that are fully sustainable or repeatable, year-after-year and generation-after-generation, without causing ecological harm. As highlighted before, permanent agricultural practices do not require non-renewable inputs, such as petroleum to make or fuel machines or petroleum-based fertilizers to enrich soil. They also do not use practices that deplete or harm soil and other natural resources. And they do not rely on non-sustainable human or animal labor – work that is self-limiting by being exploitative, injurious, disaffecting, or impoverishing. Importantly, these and other permaculture practices are a reminder that human agriculture has been and largely remains impermanent as an economic system or set of technologies. By this, I mean that agriculture, as commonly conceived and practiced today, is a naturally time-limited human activity and will eventually fail through ecological impairment, taking down the societies that depend on this roughly 10,000 year old approach to human food production. Our dominant agricultural practices today, in fact, have reliably and equally caused both the rise and fall of many past civilizations – see Collapse for a detailed study of this historical process – and the case for moving away from them is both compelling and urgent (in historical and inter-generational terms). Given agriculture’s strong historical pattern of ecological harm, you might think that our global society has already adequately dedicated sufficient scientific resources to the establishment of permanent agricultural systems and is now steadily moving toward a sustainable state of agriculture – and thus toward sustainable economics and culture more broadly. But this is not the case. Today, we are still not moving toward permaculture, in the agricultural or larger sense of the word, at least not yet. The reality in our time is that our agricultural systems, and thus all of our modern economic and social systems, are generally no more sustainable than they were a generation ago. And these systems are perhaps actually less sustainable and more precarious than they previously were – even as they are more productive – when measured in terms of soil fertility, our reliance on non-renewable inputs, and overall system diversity and resilience. Agriculture today is of course infused with vast and even startling modern technology and takes place on an unprecedented scale, but in at least one essential way it is unchanged from centuries before our time – our agriculture is still not sustainable and will eventually collapse, without a more progressive and deliberate movement toward permaculture in the way we produce food and live more generally. Each year, we move ever closer to this waiting eventuality of agricultural and social decline, and throughout the world. We rely on vast non-renewable inputs to enable our agricultural systems. Many of these systems in turn aggressively deplete soil, and harm or directly reduce natural resources. Our current approach to food production commonly promotes desertification and increases atmospheric carbon dioxide. And nearly all of our dominant agricultural (and social) practices undermine the long-term health of local and global ecosystems. The links I have included above will take you to more information on these important and ongoing effects of our modern agricultural systems – systems upon which we all depend. But to summarize and make quite vivid the overall effect of modern agriculture, I have included the chart below. It highlights current human-induced soil erosion around the world, almost all it owing to present-day agricultural practices. As you can see, much of our arable or food-producing land today is rapidly eroding and threatened, and this is primarily due to ecologically harmful agricultural practices. What may be less clear from the chart is that some of the earth’s landmass is already fully eroded or desertified, owing to past human agricultural methods. If you look closely at the gray areas of the map, you can see that sizable portions of this land are modern-day deserts (called wastelands by the chart’s authors), but were once rich farmland in pre-modern times, before this land was denuded by traditional agriculture. While you consider this sobering and perhaps unexpected chart, it is essential to keep in mind that the modern permaculture movement emerged out of exactly this type of analysis, as well as new scientific awareness in two crucial areas. As we have discussed, one of these areas is new understanding that our agricultural systems, and thus our economic and social systems, are not sustainable as presently structured. But the second and more hopeful impetus for permaculture is new awareness that non-destructive, scalable, and fully sustainable alternative agricultural practices may be possible – in particular, via farming, ranching, and food gardening methods modeled on and/or in closer harmony with the earth’s naturally evolved ecosystems. With this tandem sense of threat and opportunity, modern permaculturalists and ecologists today point to a number of traditional and modern-day agricultural practices that are unsustainable, detrimental, and in need of rapid replacement, some of which we have discussed and are summarized below in my Five Ways Farming Threatens The Planet chart. At the core of these detrimental farming practices is the single most important and immediate problem with traditional and modern agriculture – soil impairment. And at the root of impaired soil health is what is called tillage agriculture, a centuries-old and ongoing practice involving the growing of annual staple crops and animal feeds on turned soils. This important practice of annual cultivation on turned soils was of course at the very heart of our species-transforming Agricultural Revolution roughly 10,000 years ago and remains our dominant approach to cropland agriculture today. In practice, though soil tilling or turning enables the use of novel and remarkably productive annual and monocrop friendly plants like modern grains and legumes, it also directly leads to soil erosion via both wind and rain exposure. Tillage farming also causes the destruction of organic material or humus in soils, via the unnatural exposure of turned soil to air, resulting in accelerated and unnatural oxidation. Through tillage and annual monocroping, soil is progressively lost and degraded until it has been rendered unfit for agriculture – at first, unless artificial fertilizers are used, and later, even with them. Importantly, new no-tillage and organic monocrop food production techniques have been shown to slow (though not stop) the natural trend of annual agriculture to engender soil degradation and ecological decline more broadly. But these new techniques still require significant non-renewable, expensive, and polluting inputs. This includes heavy equipment and fuels to plant and harvest non-tilled staple plants, and intensive water utilization. And no-till monocropping, even amidst organic methods, also leads to unnatural soil compaction, surface and ground water loss, soil and ecosystem biota loss, and soil demineralization. Just as with tillage production techniques that use extensive petrochemical fertilizers and other non-renewable inputs, even organic no-till monocrop annual systems by definition reduce ecological diversity and soil health, lead to inefficient water use, fail to increase long-term soil health relative to the soil-building of natural ecosystems and permaculture, expose people to unnecessary food supply risks, and ultimately do not change the precarious and unsustainable trajectory of resource-intensive annual agriculture systems – and the societies that depend on them. Let me stop our discussion of agricultural essentials here, with the idea that tillage agriculture and monocrop farming more broadly are practices at the heart of agriculture’s lack of ecological sustainability today. While there are other important food production proposals within the permaculture movement – including sustainable grassland ranching practices and methods to reverse desertification in previously tilled or unnaturally grazed areas – the idea of moving away from soil tillage and monocrop agriculture is perhaps permaculture’s most important and evocative proposal right now. 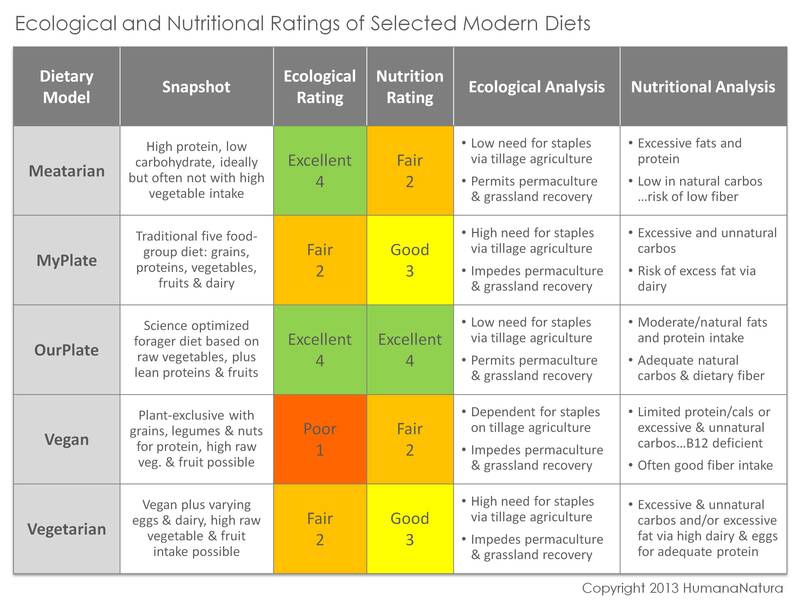 Importantly, while all of these measures are crucial to modern permaculture systems and design practices, they are not needed to compare the ecological health of various modern eating approaches. As you will see, simply by considering any modern diet’s need for substantial annual monocrop foods is enough to determine the relative ecological merits of any modern eating practice or model. Any dietary model that depends significantly on annual staples and mono-cropping can be shown to be inherently less ecologically healthy than diets that do not use these foods and cultivation practices. And where diet avoid or minimize reliance on annual monocrops and permit ecologically diverse food foresting, and also allow the sustainable use and recovery of the world’s grasslands, the ecological case for these nutritional approaches is quite clear. Of course, as discussed already, the ecological case for a particular approach to human eating is only half of the equation we are seeking to solve. To complete our understanding of the needed processes and goals of permaculture food production, we must also consider the human health merits of different approaches to modern eating. Let’s turn to this crucial companion topic next. Though the ideas and proposals of permaculture to date give us an important and even potentially civilization-saving perspective on current and past agricultural practices, they do not generally tell us what foods we should eat – and instead focus more on how the foods we do eat should be produced. The exception to this of course is permaculture’s admonishment against foods that cannot be produced sustainably. As indicated, a key group of modern foods in this category are annual staple plants like grains, cereals and legumes, especially when grown at scale. For this reason, as important as current conceptions of permaculture may be to promoting ecologically sustainable food production, they are still insufficient on their own to ensure health optimizing human life, a state which includes but extends beyond ecological considerations. For example, there are foods potentially producible sustainably that are less than ideal nutritionally, such as high-sugar foods derived from perennial fruit plants. And similar examples can be found for sustainable but less than optimally healthy labor and community design practices, to begin a list. Thus, without a positive model or understanding of what foods – or what other societal and material features – are needed for optimally healthy and flourishing human life over time, permaculture systems will provide process goals and helpful but partial information only. Such process-based systems and models will be an incomplete solution for achieving true human permanence – a state which will necessarily take the form of naturally progressive, health-increasing, information seeking, and adaptive human cultures. As suggested before, we can already see this natural incompleteness of past and current permaculture efforts. Examples include the widely varying and often less than optimal dietary regimens of permaculturalists (leaving aside diets that are patently inconsistent with core permaculture principles). It is apparent in similarly ambiguous and less than adaptive lifestyle goals and norms among self-identified permaculturalists. And it can be seen in a common disdain of advanced technology among permaculturalists, which is inevitably a maladaptive ideology (for a species that likely will be called upon to divert large asteroids at some point to ensure our permanence). For these reasons, to arrive at a more complete understanding of what permanent and healthy human life entails, we must carefully ground ourselves and the goals of permaculture in the science of optimal human living and adaptation, now and over time, so that we create a new, fuller, and ongoing model for human life that is naturally healthy, vital, adaptive, and truly permanent. Such a synthesis of science and ideas can and must occur in many areas – ultimately bridging and advancing our understanding of how both ecological and human health will be achieved in the future – including the critical areas of food production and nutrition. I suggested before that re-naturalized modern eating is healthier for both us and the planet and now will explain why. This explanation of course requires me to define what I mean by natural modern eating, show that this form of eating is optimally healthy for humans, and make a reasonable case that this diet can be provisioned sustainably at modern population levels (for billions rather than simply millions of people). When I talk about re-naturalized eating for modern people, I mean using science to identify optimal variations on the way humans ate in nature – for the millions of years that preceded the Agricultural Revolution and the onset of annual monocrop farming and animal husbandry 10,000 years ago. This proposal assumes, with good reason, that humans are naturally adapted for this earlier pattern of eating, often called a forager diet, and that optimal nutrition today (as well as other beneficial personal and social attributes) will generally involve variations on our earlier pattern of life. The approach also assumes that this earlier pattern of human life may have important ecological health dimensions as well, since it evolved over enormous expanses of time and has withstood significant environmental stressors – though at much lower human populations than today. As a practical matter, there are three critical ways we can use science to determine an optimally healthy human diet, or to optimize any other aspect of modern human life. One way is to study our evolutionary past and natural human niche, and then to extrapolate forward needed conditions and practices to optimize our health today. This approach takes advantage of the idea that long-evolved and relatively stable human attributes (notably those from before the disruptive Agricultural Revolution) are apt to promote health today. But this approach can be imprecise and error-prone, since health optimization in the modern world may involve new strategies and require entirely new human attributes. Still, it is hard to make the case that the attributes, and thus lessons, of millions of years of successful natural human living should be dismissed completely. A second use of science to determine an optimal human diet (or overall lifestyle) is to study current eating practices over time across large numbers of people and then to statistically determine which approaches best promote key health and well-being outcomes. This so-called longitudinal approach has been and continues to be our primary method for studying optimal nutrition today and has produced many important findings. But this approach also has downsides and suffers in at least three ways. Longitudinal sampling is costly. It is time-consuming. And it can be naturally biased toward (tending to reinforce) variations on current dominant lifestyle patterns. In the case of nutrition, this bias takes the form of over-sampling typical modern eating choices and under-sampling new or atypical patterns – ones that may be objectively healthier – including pre-modern and pre-agrarian eating patterns. A third approach to using science to define optimal nutritional conditions is of course to combine the previous two methods, examining the features and attributes of natural human life, and then testing hypotheses that combinations of these features are healthier than current or typical practices. In and out of nutrition, this approach does not eliminate the need for studying modern lifestyle variations and innovations, but it can help to better focus research efforts, and reduce costs and bias, by focusing or re-weighting scientific attention on earlier and long-selected aspects of natural human life. This third approach is favored and used by HumanaNatura – which we call a dual-use of science or the balanced probing of past and present conditions of life. Importantly, it is also the general (though not exclusive) approach taken by permaculturalists today in their design and testing of new food production systems, where long-evolved ecological models are tested against and compared with modern farming and food gardening practices. From an evolutionary science perspective, we should expect or at least can hypothesize that the oldest foods (like other lifestyle attributes) in this timeline are most apt to be necessary to optimal human health today, since they reflect conditions when large portions of our human and pre-human anatomy and physiology developed. By contrast, we might be more skeptical about the benefit of newer historical changes for our health, even foods like cereals that led to the rapid reproduction rates of the Agricultural Revolution (reminding us that reproduction and health are only partially correlated). As I mentioned, this use of historical or retrospective science is not a perfect method, but it is a way to make better use of our natural history as a data source and to consider its perhaps essential lessons. In practice, the approach can be more efficient and insight-rich than beginning without preconceptions or taking our present conditions as a baseline. As you perhaps can sense, this use of natural history proves to be a reasonably good starting point for formulating a model of optimal human eating. When we turn to the scientific study of modern eating practices, we find that many (but not all) of these ideas have been validated through modern research. Importantly, where there are differences, this may mean that evolutionary science-based ideas are incorrect, or that modern dietary investigations are biased or incomplete. A full review of the proposals and differences of evolutionary-based natural eating models and those of longitudinal studies of modern eating habits is beyond the scope of our discussion, but are adequately encapsulated via two dietary models that we will discuss in the next section. The first of these models is HumanaNatura’s Our Plate natural eating model, which reflects our dual-use of science and has been intentionally designed to reflect and optimize pre-agricultural eating, by using both historical information from research and key findings of modern nutritional science. These findings include: 1) the importance of a fiber, vitamin, and mineral rich diet that is high in raw vegetables and fruit, 2) the desirability of moderate amounts of lean meat, fish, and tree nuts for essential protein and fats. Please note that the OurPlate approach includes cooked meat and fish but not cooked starches (root plants such as potatoes). By contrast, the second of the two models reflects more mainstream scientific thinking today about optimal human eating. Created by the US government and called MyPlate, this approach downplays evolutionary science considerations and instead emphasizes a perhaps familiar and decidedly post-agricultural five food group model. The five MyPlate food groups are 1) grains, 2) animal and plant proteins, 3) vegetables, 4) fruits, and 5) dairy products. Importantly, one crucial change in the relatively new MyPlate model – relative to the older and more carbohydrate-intensive U.S. government food pyramid model it was designed to replace – is that sweets are no longer included. HumanaNatura believes this is a step in the right direction. However, based on recurring research questioning not just direct sugar consumption, but indirect sugars via cooked starches and grain-rich diets as well (and thus carbohydrate-intensive eating more generally), HumanaNatura believes that additional changes to MyPlate – moving it still further away from the outgoing food pyramid model – are needed and will follow over time. If you were previously unfamiliar with permaculture, modern dietary science, or both topics, I’ve given you a lot to consider. But I have also equipped you to fairly carefully understand and communicate the relative desirability of modern farming and eating practices against the essential and twin goals of ecological and human health promotion. I would encourage you to take time to consider my analysis of the five model diets I have presented, and then perhaps to rank other diet programs or your own eating patterns against the nutritional and ecological criteria I have presented. For me, a clear takeaway from this analysis is that the still-young and growing global permaculture movement would be well-served by closer alignment with science-optimized forager diets – ones more or less along the lines of HumanaNatura’s OurPlate natural eating model. Not only can this at-once old and new approach to human eating help to make modern permaculturalists healthier, it can allow them to do this far more sustainably than with other nutritional approaches and in ways that are much more aligned and consistent with permaculture food production principles. What remains to be explored is the extent to which forager-oriented diets can be scaled to sustainably serve modern population levels. But we have good reason (see here and here) to believe this may be the case, because of permaculture’s apparent ability to restore vast desertified areas of the earth and greatly improve overall grassland yields. These steps could markedly improve world food production and naturally produce a food mix that resembles forager eating, while sequestering significant amounts of atmospheric carbon. Although the idea that forager-based forms of modern eating are both nutritionally and ecologically much healthier may initially be surprising, it really shouldn’t. After all, though requiring scientific exploration and optimization, this pre-agricultural approach to eating and food production has existed, and has been naturally selected to promote both human and ecological health, for millions of years already. We therefore have good reasons to expect this long-evolved approach to human eating (and living) will continue to provide important natural benefits in the modern age – and even to be potentially necessary to our long-term species survival. Before we finish our discussion of permaculture and human health, I would like to emphasize that our critical modern opportunity for both re-naturalized eating and re-naturalized food production is a waiting potential and connection that far too few permaculturalists have yet made (just as have too few nutrition and health advocates). To underscore this point, I’ll provide four brief snapshots of representative permaculture operations, based on my own informal but broad survey of self-described permaculture farming, ranching, and gardening practices today. Please note that all of the examples are aggregated constructs, but I think each aptly reflects the range of endeavor underway today in the permaculture movement. Importantly, please also note that I have intentionally set the size and scope of each example at the small commercial or multi-family level for case richness and to allow easy comparison. At the same time, however, the lessons of these examples are fully scalable – from much smaller family-level or single-person food forests all the way to large commercial or institutional permaculture operations serving metropolitan populations. > MyPlate Meadow – the Meadow is an ordinary permaculture operation, in the sense of being representative of mainstream permaculture theory and practice today. It covers roughly 20 hectares of rolling hills in a subtropical climate. The Meadow includes a large pasture area and a series of swaled food forests of increasing age and size. 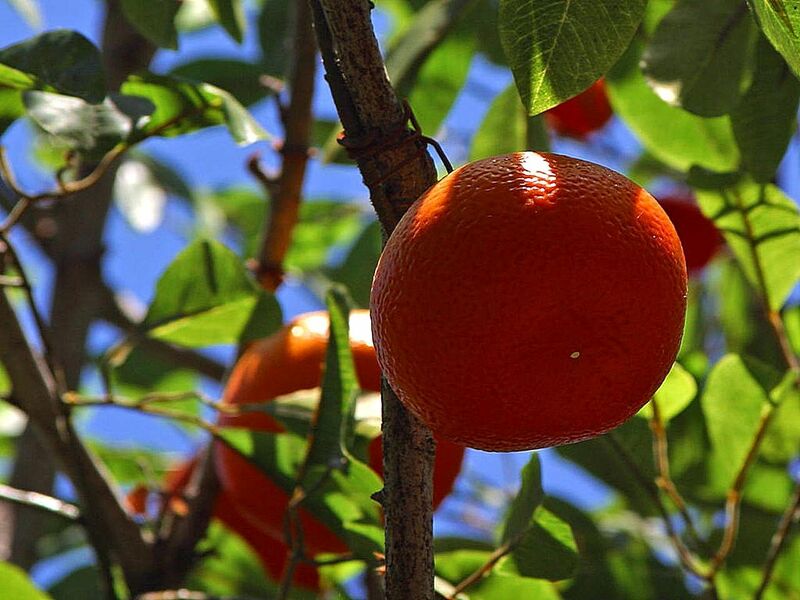 The food forests contain over 100 species of plants, including extensive fruit trees, shrubs, and vines, several species of nitrogen-fixing trees, and a variety of starchy root plants. The Meadow also includes a quarter hectare vegetable garden. Birds and goats are kept for eggs, milk, and meat, as well as for vegetation recycling, pest control, and soil building. Overall, the Meadow is largely self-sufficient and even sells food seasonally at a local farmers market, but its members do rely heavily on starchy plants for calories and are not entirely soil-friendly, since they regularly import whole grain flours for bread making to supplement their self-produced foods. > Vegetarian Vista – the Vista resembles the Meadow in many ways. The Vista is about the same size, but is located in a temperate climate. Its food forests have a different mix of plants, but are similarly proportioned between fruiting plants, nitrogen fixers, and root plants. The Vista also has birds and goats, but they are used for eggs, milk, and plant recycling only. As these animals become unproductive, members of the Vista seek to find long-term homes for them, but this is not always possible and represents a reduction in their productivity and sustainability. Also like the Meadow, Vista members rely heavily on starchy plants for calories and import even more whole grain flours and beans for bread making and cooking to supplement their self-produced foods. > Vegan Veranda – our next permaculture farm is slightly smaller than the first two, covering about 10 hectares. It is located in an area with a Mediterranean climate, marked by short wet winters and long dry summers. The Veranda has proportionally less meadow and more food forest than the Meadow and Vista, but has a similarly sized vegetable garden. The make-up of its food forests is roughly a cross of the previous two examples, with similar proportions of trees, shrubs and root plants. Because of its dry summers, the Veranda uses a drip irrigation system in its forests, fed by an on-property and solar-powered well and graywater recycling. It has no animals, uses vegan humanure only to fertilize its property, and employs a variety of plant-based strategies to discourage pests. Because of these limitations, productivity is lower than at the Meadows and Vista. But like these examples, Veranda members rely heavily on starchy plants for calories and import extensive amounts of whole grain flours and beans for bread making and cooking to supplement their self-produced foods. > Forager Field – as its name implies, the Field is designed to support a forager-style eating pattern, and has a number of important differences from the other three permaculture examples. First, it is located in a relatively dry climate, one that receives less than 30 centimeters of rainfall a year. The Field is also larger, comprising nearly 80 hectares, though the amount of land that is in forest is comparatively small. Much of the Field is instead restored grassland and covers an area that was highly desertified before restoration efforts. Today, much of the Field is mob-grazed with goats to replicate natural grassland animal patterns and promote soil health, These goats are used exclusively for meat. In a small canyon area with a seasonal stream, there is a small vegetable garden and a two hectare food forest in development. This effort is aided by bird flocks that are used for plant recycling, pest control, and egg and meat production. While the stream’s flow rate and duration has improved from the Field’s permaculture efforts, its food forest still requires regular irrigation during much of the year, accomplished via an on-property and solar-powered well and graywater recycling. Notably, the Field’s food forest includes root plants, but primarily for ecological reasons and only secondarily as a reserve food source in case other supplies run low. Overall, the Field is entirely self-sufficient nutritionally, fully enables the Our Plate natural eating model, and is also a modest exporter of grass-fed organic meat. In keeping with its focus on enabling a pre-agricultural human eating pattern, it imports no grains, beans, or other farm foods. These four examples I think represent a majority of self-described, smaller-scale permaculture enterprises in our time. Each naturally reflects or enables varying dietary assumptions and employs very different gardening, farming, and grazing practices and strategies. If you are new to permaculture, the examples should help to give you a better feel for the current scope and range of permaculture practices in use today – at least in name, if not always in principle. On the other hand, if you are already familiar with permaculture or are a practicing permaculturalist, I hope these examples and the critical differences I have highlighted between them will prove thought-provoking and perhaps strategy-changing for you. In the least, I hope these examples will encourage you to make your nutritional and food production goals more explicit and informed. And I hope they will inspire progressive action on your part to better align your actions with our urgent need for both ecological and human health – in the ways we produce and consume food, and in the ways live more broadly. As you can see from my examples, a move to re-naturalize our eating practices – via Our Plate or other eating programs that seek to restore and scientifically optimize our original forager diet – can be a powerful natural complement to permaculture’s essential mission of re-naturalized and sustainable modern food production. With new emphasis on the science of natural and optimal human eating (and healthy human living more broadly), I believe today’s permaculture movement can be made far more scientifically rigorous, more internally consistent and complete, more able to take advantage of waiting natural health synergies, and more effective as a catalyst for progressive societal change. New awareness of human health needs and greater focus on scientifically re-naturalized living promises to allow permaculture to more easily accomplish its goals, better balance its use of science and focus on our twin needs of human and ecological health, and accelerate our collective movement toward truly permanent and self-renewing economic and social systems. By more deeply exploring the ancient, concurrently evolved, and powerful connection between natural human eating and living on one hand, and natural human food production and social institutions on the other, permaculture will be able to better sense and more effectively support our total human and ecological health needs. As we have discussed, you can learn more about the practice of scientifically optimized forager eating via OurPlate, HumanaNatura’s natural eating guide. If you want to explore the science and principles that underlie this at once new and old approach to eating, or other techniques for re-naturalized and naturally progressive modern living, click-through to HumanaNatura’s comprehensive Personal Health Program. Please note that all of these resources are free for personal and non-commercial use. Whatever lessons you take away from this extended discussion of Permaculture & Human Health, I’d enjoy hearing about them, via comments below or Contact Us, especially as you begin to make use of these critical ideas to better advance your own health and quality of life, and that of our larger social and natural environments. Mark Lundegren is a writer and teacher, and the founder of HumanaNatura. 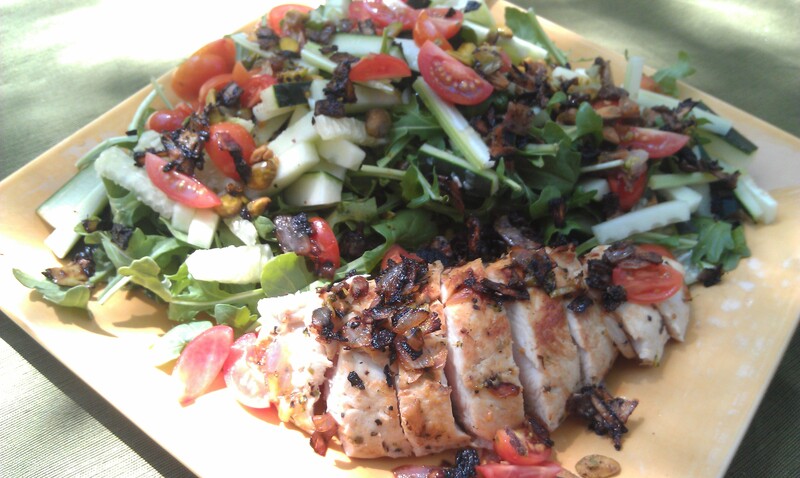 This entry was posted on August 21, 2013, 14:40 and is filed under Natural Communities, Natural Eating, Natural Living. You can follow any responses to this entry through RSS 2.0. You can leave a response, or trackback from your own site. Hi Mark. I agree with you on the whole and have a few comments. First, the place in which someone lives, the character of the land, its wildlife and communities, is the base that dictates what dietary and lifestyle choices are possible. Healthy human life can’t be designed – it must emerge, in interaction and relationship, each one unique. The examples do well to make your point, but most people in the world do not have the choice of 10 hectares of Mediterranean climate vs 80 hectares of desert – they live where they are and adapt (or not) to what is there. Permaculturists might live out their own particular brand of hypocrisy – but I would say that most have visions that are internally consistent. The difficulty is in integrating those visions with the realities of the world as it is. Please convince me that forager diets are scalable! Thanks for your thoughtful comments (and broken link catch). Based on your feedback, I’ve added a new paragraph just before the four permaculture examples. It makes clearer that the examples are intentionally sized at the multi-family level for richness and to aid comparison, but that the lessons they provide are scalable from smaller family food forests to much larger permaculture enterprises (i.e. serving urban populations). At any scale and for any locale, I think the primary lessons of the examples and the article overall are the same, First is that broad reliance on annual staple foods is not consistent with permaculture goals and global ecological health. Second, and perhaps more importantly, is the idea that this traditional eating pattern is neither necessary nor desirable, since both health and planet friendly eating is now readily achieved at scale via optimized variants of earlier forager eating – diets making little or no use of annual staple foods. As you point out, we all are situated where we are, and in the future will be where our efforts and circumstances take us. But whether we are urban dwellers, live on small hillside plots in temperate climates, or reside on open grasslands, all of us can immediately re-naturalize our diets (via OurPlate or its variants), eliminate or greatly reduce annual staple food use, and directly or indirectly encourage new social movement toward both natural health and permaculture ideals in a single, holistic,and self-sustaining movement. Thanks again for your comments and interest in this important topic.